In a high speed blender, blend the lemon juice, pure water, garlic, sage, thyme, oregano and salt and thoroughly blend. Transfer to a mixing bowl and add the almond pulp, flaxseeds and olive oil. Knead the mixture by hand until a consistent, doughy texture is achieved. Spread the mixture onto 2 dehydrator trays lined with Texflex sheets (add a little extra water if the mixture is too thick to spread evenly). 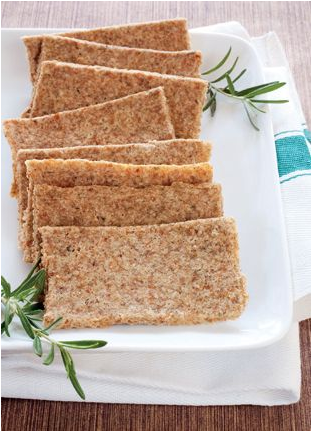 Score the crackers before dehydrating, dividing each tray into 24 crackers by scoring 3 cuts vertically and 5 cuts horizontally. Dehydrate for 12 to 14 hours at 105°F. Flip the crackers onto another dehydrator tray, peel off the Texfelx sheets and dehydrate for an additional 12 to 14 hours. Store in a cool, dry place until ready to serve. Enjoy with your favourite spreads and dips.